NXP's Cortex-M0 LPC11D14 microcontroller in 100-pin LQFP package. All LPC11D14 pins are available on expansion connectors around the processor (100 mil/2.54 mm pitch dual rows). UART-to-USB bridge interface for LPC11D14 UART, with mini-B USB connector and proper ESD protection. SWD/JTAG connector (50 mil/1.27 mm pitch, standard SWD/JTAG connector). Pad for older, larger 20pos 100 mil pitch JTAG connector also exists, but connector not soldered. LCD with 8 14-segment characters. Trimming potentiometer on analog input. Onboard reset generation and reset push-button. Push-button for enabling Bootloader mode of the LPC11D14. Push-button for enabling start logic of the LPC11D14. Push-button for wakeup logic of the LPC11D14. Possibility to measure current consumption for LPC11D14 core, I/O and LCD controller parts individually. Crystal: 12.000 MHz external crystal. 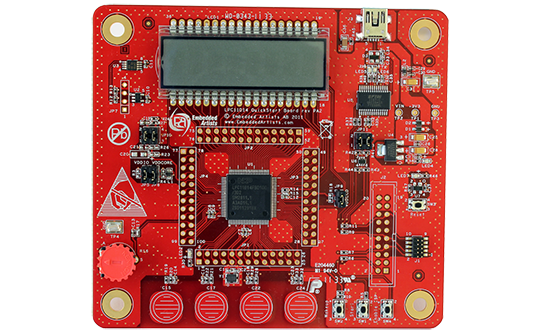 The LPC11D14 runs at frequencies up to 50 MHz.